I do not have any relations like father, mother, brother and friend except you Oh Giridhara Gopala. I have searched the world and found nothing worthy of love. Hence I am a stranger amidst my kinfolk and an exile from their company. I seek the companionship of holymen where alone do I feel happy. I am nurturing the creeper of Love by the waters of my tears. Now it has grown and overspread my dwelling. 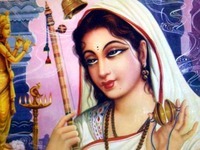 Now Meera is absorbed and immersed in contemplation of Giridhara, so let whatever might happen.